A four-year-old otherwise healthy girl presented to our outpatient clinic complaining of left elbow pain and swelling. The child’s parents reported an indoor trauma the previous day. On clinical examination, the left elbow and forearm exhibited diffuse swelling. The gentle passive range of elbow and forearm motion was normal and mostly pain-free. Nevertheless, the radial head was stable but a palpable click was noted. The neurovascular examination was normal. 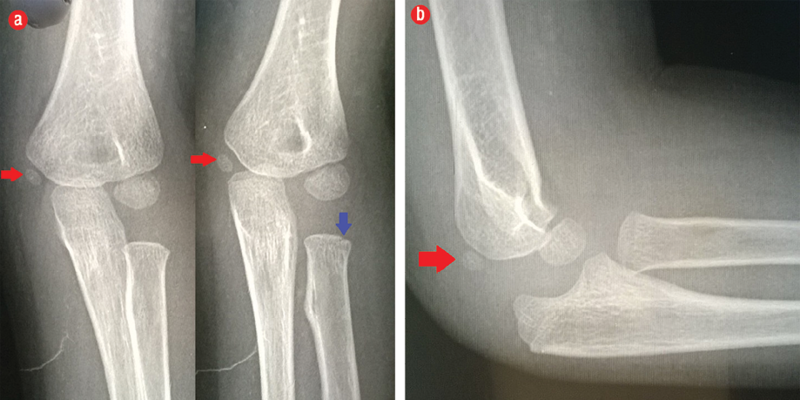 The patient received radiographs of the traumatized left and normal right elbow [Figures 1 and 2]. Radiographs of her left forearm were unremarkable. a. First-degree supracondylar humerus fracture. b. Slipped proximal radial epiphysis. c. Normal anatomic variant simulating pathology. d. Non-displaced lateral condyle fracture. Figure 1: Left elbow radiographs. (a) Two anterior-posterior projections of the left elbow. Note the presence of a well-ossified medial epicondyle epiphysis (red arrow) and simultaneous absence of the radial head epiphysis. Typically, the center of the radial head should ossify before that of the medial epicondyle. Notice the notched radial metaphysis (blue arrow). This notching is undetected in the other projection because of forearm rotation as indicated by radioulnar overlap. (b) Lateral view verifies the presence of well-ossified medial epicondyle epiphysis (red arrow) and simultaneous absence of the radial head epiphysis. Figure 2: Anterior-posterior and lateral radiographs of the normal right elbow. The radiographic appearance is identical to the left elbow regarding the reversal of the chronological order of ossification and notching of the radial metaphysis. Interestingly, our patient showed a disturbed sequence of ossification. Her radiographs demonstrated a well-ossified medial epicondyle, while the epiphysis of radial head was completely non-ossified in orthogonal views. This ‘reversal’ of the chronological order of appearance of the elbow ossification centers represents a rare but normal anatomic variant simulating pathology. Plain radiographs of the contralateral elbow revealed identical findings, thus confirming our diagnosis. Furthermore, our patient’s elbow showed another anatomic variant simulating pathology, namely the notched proximal radial metaphysis. This notch or discontinuation is suggestive of a fracture. Likewise, the trochlea and olecranon can have two or more ossification centers, which can give them a fragmented appearance. These normal anatomic variants conditions are more commonly encountered compared to pathologies such as fractures or avascular necrosis. However, the presence of an ossified trochlea epiphysis without an ossified medial epicondyle epiphysis usually indicates an avulsed medial epicondyle and subsequent intra-articular entrapment. Such scenario can lead to potentially serious consequences if it is not detected.9 First-degree supracondylar humerus fracture and non-displaced lateral condyle fracture are unlikely diagnoses because neither a fracture line nor an abnormal fat pad sign is detectable. Additionally, the presence of a relatively smooth but full range of motion at the elbow and forearm precludes the diagnosis of slipped proximal radial epiphysis. The present case spreads awareness amongst the radiologists and orthopedic surgeons on the importance of differentiating normal from abnormal findings in acute pediatric elbow injuries. Such knowledge will definitely help physicians to make better clinical judgment and avoid unnecessary investigations and interventions. 1. Emery KH, Zingula SN, Anton CG, Salisbury SR, Tamai J. Pediatric elbow fractures: a new angle on an old topic. Pediatr Radiol 2016 Jan;46(1):61-66. 2. DeFroda SF, Hansen H, Gil JA, Hawari AH, Cruz AI Jr. Radiographic evaluation of common pediatric elbow injuries. Orthop Rev (Pavia) 2017 Feb;9(1):7030. 3. Iyer RS, Thapa MM, Khanna PC, Chew FS. Pediatric bone imaging: imaging elbow trauma in children–a review of acute and chronic injuries. AJR Am J Roentgenol 2012 May;198(5):1053-1068. 4. Goyal T, Arora SS, Banerjee S, Kandwal P. Neglected Monteggia fracture dislocations in children: a systematic review. J Pediatr Orthop B 2015 May;24(3):191-199. 5. Kuptsova OA, Baindurashvili AG, Nikitin MS. Underlying causes of poor outcomes in the treatment of children with fractures of the capitulum of the distal humeru. Pediatric Traumatology Orthopaedics and Reconstructive Surgery 2016;4(1):11-16. 6. El-Sobky TA, Samir S, Aly AS. Neglected anterior Monteggia lesion with a displaced intra-articular medial condyle fracture in a child: A rare and challenging association. J Musculoskelet Surg Res 2017 Sept;1(2):49-52. 7. Ryan DD, Lightdale-Miric NR, Joiner ER, Wren TA, Spragg L, Heffernan MJ, et al. Variability of the anterior humeral line in normal pediatric elbows. J Pediatr Orthop 2016 Mar;36(2):e14-e16. 8. Procell Villalobos CR, Cassis Zacarías N, Juárez Rojas CS, Cárdenas Turrent MB. Order of appearance of ossification centers in the elbow of Mexican children between 6 months and 12 years old. Acta Ortop Mex 2008 Nov-Dec;22(6):347-349. 9. El-Sobky TA, Haleem JF, Sakr HM, Aly AS. A neglected markedly displaced medial epicondyle fracture with a simultaneous ulnar nerve palsy in an adolescent. Clin Orthop Surg 2017 Dec;9(4):542-546.